The UV index reading allows the user to determine with accuracy the potential levels of harmful ultraviolet light exposure and to take the appropriate steps of avoidance or protection from sunlight when the index is too high. This UV light intensity tester has a monitor that displays the UV index as well as the clock, alarm and calendar. Ergonomically designed to fit the user's palm, SunKnown UV light checker provides a super easy way to find out how much UV radiation is hitting you or your beloved ones at home, in the car, office, or any other indoor and outdoor location. Ergonomically designed to fit the palm or carried using a strap attached to its built-in ring. Easy to operate: Press the "UV Check" button to read the index by pointing the UV sensor directly toward the sun. 4-digit display for month, date, hour, minutes, seconds as well as an alarm. 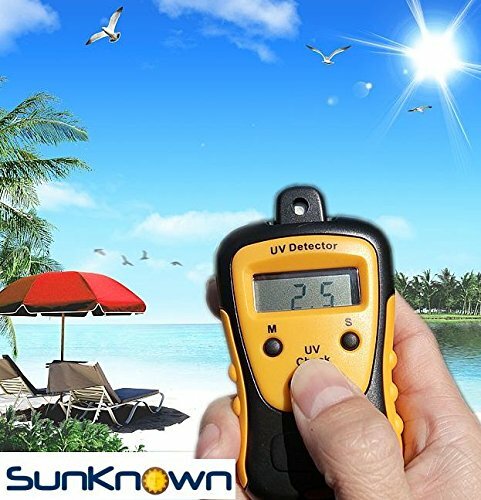 SunKnown MULTIFUNCTION UV LIGHT METER IMPROVES THE QUALITY OF YOUR LIFE by measuring the strength of the sun's UV rays on a given day so you can decide what protection you need to wear that day and how long it is safe to stay outdoor. WITH THIS PORTABLE SOLAR UV LIGHT PHOTOMETER YOU ARE IN CONTROL OF YOUR DESTINY - Use it to measure each day's risk of getting sunburned or exposed to high levels of cancer-causing UV radiations, and adjust your outdoor living behavior accordingly. WITH THIS HANDHELD ULTRAVIOLET LIGHT STRENGTH TESTER YOU CAN CHECK THE EFFICIENCY OF SUN PROTECTION provided by your sunglasses, car or window glasses, hats, clothing and sunscreen. The product manual provides simple instructions on how to run these tests. THIS UV RAY DETECTOR & SUNLIGHT INTENSITY CHECKER HAS A MONITOR THAT DISPLAYS THE UV INDEX AS WELL AS THE CLOCK, ALARM AND CALENDAR, and is ergonomically designed to fit in your palm. This device is not designed to measure UVA and UVB from artificial fluorescent bulbs. SunKnown SOLAR LIGHT METER IS EASY TO OPERATE - Press the "UV Check" button to read the UV index (0 to 20, at 0.5 steps) by pointing the UV light sensor toward the sun. It shows a single UV index for both show UVA and UVB emitted by the sun. Batteries are included. If you have any questions about this product by SunKnown, contact us by completing and submitting the form below. If you are looking for a specif part number, please include it with your message. American Educational Faux Animal Fur Friction Pad 3 Length 5" Width (Bundle of 5)"